After leading McGill University’s team to victory in the zero-emissions category at this year’s Clean Snowmobile Challenge, Ali Najmabadi, a mechanical engineering undergraduate student, accepted the U.S. National Science Foundation’s invitation to visit Summit Station. 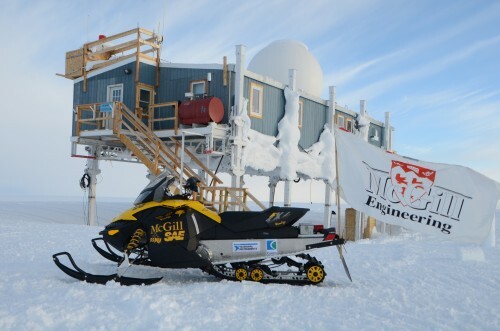 In addition to field-testing the machine during his June visit to Greenland, Najmabadi experienced first-hand the brutal polar conditions that challenge mechanical equipment, and observed how Summit scientists and staff use vehicles in their work around the clean air/clean snow research facility. The McGill team will leverage insight gained from the visit when they return to the lab in the fall. A tendency for the battery to over-discharge (due to operator error and/or a design flaw) limited the snowmobile’s use. But we say such is the value of field testing: it teaches most, perhaps, when it reveals vulnerabilities. We look forward to seeing what McGill does in 2014.